For many generations, noted thinkers have doubted that a litigious burgher in the English Midlands authored works superscribed “Mr. WILLIAM SHAKESPEARES”. 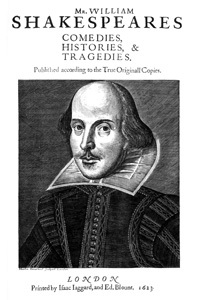 Ralph Waldo Emerson considered the story of the Bard’s Stratford origin “the first of all literary questions.” (Bacon 73). In the early twentieth century the diffident novelist Henry James wrote, “ I am 'sort of'’ haunted by the conviction that the divine William is the biggest and most successful fraud ever practiced on a patient world.” He added, “It bristles with difficulties…” (James 432) The Shakespeare industry–– foundations, the academy, tourist and publishing interests––emphatically declines to doubt the received biography. If James’s intuition proved true, the Stratford Shakespeare legend was mere fiction, early fraud accrued into a cultural precept. Episodic discourse engages the issue without resolution, owing to divergent interpretations of what counts as evidence. Meanwhile the scholars overlook extant historical data: the 1623 First Folio title page’s engraving by Martin Droeshout, which is opposite Ben Jonson’s commemorative poem. Neither needed to be abstruse but were so designed.